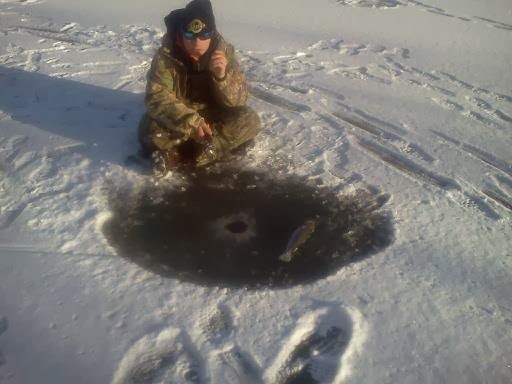 Everything That Swims: Ice Fishing in Virginia? Today, for the first time in my life, I was able to ice fish "for real" (not from the bank, a dock, etc). We had night temperatures in the single digits and day temperatures in the low 20s and high teens for long enough that my neighbor's pond developed enough ice for us to safely fish on. The ice was about 3" at the thinnest, but up to 6" at the bank in certain areas. My two brothers and I rode our bikes to the pond at 3:30 with 3 ice fishing rods that we already had, and 2 makeshift ice rods. We don't own an auger, which isn't surprising considering the fact that we live in Virginia and ice fishing isn't exactly possible most winters. A spud bar for packing dirt around fence posts was our tool of choice, and with such thin ice, it was pretty easy to chop holes with it. We made our first holes on either side of a shelf that goes from 3-5 feet and I landed a nice rainbow within 5 minutes of starting. 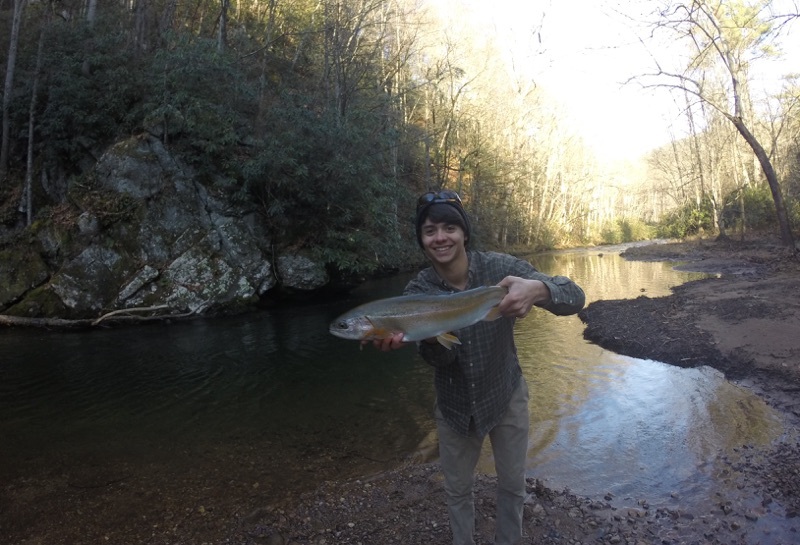 We missed a few fish, then my brother Wyatt hooked and landed another nice rainbow. The trout were definitely active, and we put 6 of them on the ice between the 3 of us in about 45 minutes. Once the sun neared the horizon, the bluegill started to bite. We caught a few on our 1" gulp minnows that we had been using, but once we switched to worms, we began hooking more of them. The fish bit until it got dark, then everything pretty much shut down. We ended the day with 6 trout and 7 nice bluegill for the table, having caught about 20 bluegill in total. Unfortunately, the weather looks like it is going to warm up pretty soon, so I don't think I will be able to fish on the ice again this winter, unless I go tomorrow after school. It was very cool to experience it though, and maybe we will get lucky with another cold spell to freeze up everything again before spring. Thanks for reading! It was pretty dark when I took this picture, and we caught 3 more keeper bluegill after I took this.